Power carving is a way of working that is either accepted as a great way of profiling and bulk removing wood prior to final fine detail work, or it is totally shunned as noisy and mucky. Power carving products are capable of fine finishing and fine detail if they are used for more than just the cursory rough removal of timber. To that end, it is the Arbortech cutter range that I am going to look at here - the products have four types of cutting blades to suit projects of all sizes. 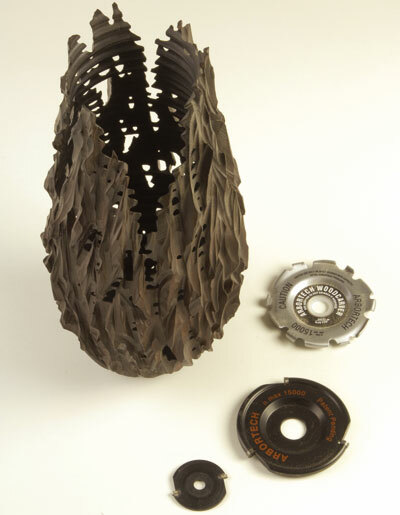 The kit comprises of a shield and a cutter - its teeth resemble a chainsaw - and fits a standard 115mm (4 1/2in) grinder. The assembly instructions are easy to follow but I have to admit that using these can be noisy and one should consider the weight of the grinder. Take regular breaks when using these items and always wear eye and lung protection. Also consider wearing ear protection. 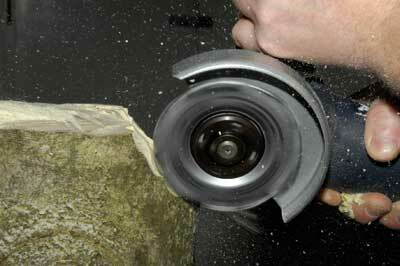 The cutters will respond directly to the angle of approach and how heavy-handed you are. In my opinion, this is a nice product to start with, it is not too taxing on the wallet and it will last. However, I could not work out how to effectively resharpen the tool, but the manufacturers have taken this into account and a replacement blade is available. The guard allows a maximum depth of cut of about 13mm (1/2in) and this is where I have an issue with the kit. Safety is all-important and having cutters running unguarded is riskier than when shielded but the shields do limit what one can do. Also, some grinders do not allow the rear metal shield to be rotated round so the plastic guarding can be used at the correct position. It might be difficult but if fitted correctly, it should look like the image above. So to use a guard or not is the question. Without a guard, the user can cut deeper and use varying angles which will influence the finish but without a guard, more mess will be created from the chips. 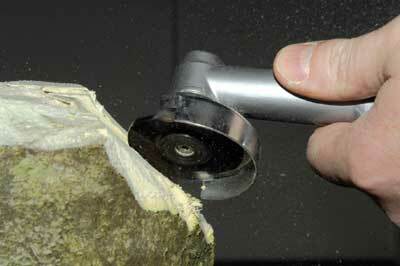 I would recommend the guard in place as this tool is primarily useful for rough initial shaping. This kit features the same guarding as the Woodpro unit and fits on a 115mm (4 1/2in) angle grinder, but the blade is totally different. The cutter sports three tungsten carbide tips which are held in place with machine screws. They can be rotated when an area becomes blunt so one has the benefit of the full 360 degrees of cutting edge life and they are replaceable. This tool has flexible uses and cuts faster than the Woodpro. As mentioned before, using the guard limits the cuts so to get the most from this tool, I removed the guard to get great slicing plunge cuts. When the blade is presented at a shallow angle, gentle skimming cuts are possible and a fine finish can be achieved which required little sanding prior to applying a finish. The teeth are about 10mm (3/8in) in size and round in profile so this too is not a fine detailing tool, but the main image gives an idea of the finishing and degree of control this tool can offer. 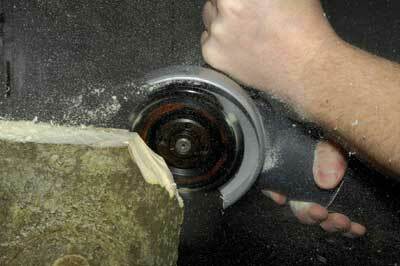 Pressure used in the cut and angle approach will alter the finish and severity of cut. I have not experienced a grab with this tool over many years of usage. 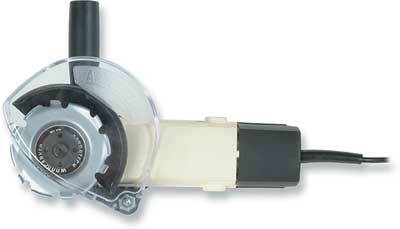 Of the two, this is more expensive but in my opinion, it is more user-friendly. It can be used at a greater degree and copes with both dense and soft timbers with ease. I have been using this one for many years and it has flexible uses. This cutter is around 50mm (2in) in diameter so is excellent for small workshop carvings. It fits into either the Arbortech mini carver extended nose, which fits a 115mm (4 1/2in) grinder angle, or in a small angle grinder/sanding unit like the Proxxon long nose grinder. It sports two teeth, non replaceable, and has a rounded cutting edge so cannot cut V cuts, but it can trench quickly in both hard and softwoods. Care should be taken, however, not to remove too much too quickly. The price of this blade is inexpensive but you will need either the mini-grinder attachment kit or a Proxxon, or similar unit to use it. These tools worked well. I favour the industrial units over the Woodpro 4 because they afford me, as a user, more variety in how the units can be used and the finished achieved with them. If you ever have the chance to use one, do! They do not replace hand skills but they do allow one to get to a form that can be either left as is or finished off later by hand. "The products have four types of cutting blades to suit projects of all sizes"